Behind the Scenes at my New Craftsy Class! I went to Denver to film my Craftsy class... Colorful Patchwork Bags and Baskets! I'm sure that you (my readers) understand how big this is for me... you already know what a huge Craftsy fan I am and how much I looooove watching and re-watching the classes. This cute sign was placed outside the studio we were filming in. On the night that I found out (a while ago) I made the mistake of sharing the news with some extended family members who know that I do something with a blog, but they really have no idea what. They responded with blank faces. Are you serious now? I can hardly believe there is a single person on this planet who has not heard of Craftsy. I'm sure I told them before. Do I live in a sewing bubble? Okay, maybe I do. But anyway, I had to explain to them that the instruction in Craftsy classes is soooo much better than most of what's on youTube. Yes, youTube has LOTS of information, but you have to spend so much time watching video after video to (hopefully) find the information that you want. And after that, you simply have to trust it's coming from a reliable source. Because really, they can (and do) put ANYTHING on youTube. A zillion cat videos for example. The wonderful thing about Craftsy classes is you know exactly what you are getting: HOURS of EXPERT instruction on just the topic you want. Plus many classes come with patterns. It's like signing up for a sewing class at your local quilt shop except the pattern is included, you don't have to go there, you can watch it in your own sewing space, again and again, and pause and rewind, and ask the instructor questions, and ask the other class member questions, and post pictures of your finished project. Wait! Does that sound BETTER than going to an actual sewing class? So that's why I've been wanting to star in my own Craftsy class ever since I watched my first one. Sometimes when I'm sewing one of my own designs I act like the sports player who's sportscasting his own moves as he makes a point. Or the cook who pretends she's Julia Child. I'm such a geek and I know it!!! My goal for this class was to make the students feel like they are sitting right there with me having a sewing afternoon with an old friend (not that we're old - just that we've been friends a long time!). Here's a snapshot that I asked my producer to take with my iPhone from his chair. Isn't that screen he was watching cool? There were three cameras rolling at all times... the footage that most clearly shows what I'm talking about at any time will be used. Love it. Better than YouTube. See where we stashed my sewing machine when it was in the way??? And you should know something else... I'm short! Only 5'4''. When I looked under the table on set, I found this 4'' tall piece of wood that I could have used to put my sewing machine pedal on. I jokingly stepped up on it to tease the camera guy who had just centered my head in the frame and guess what... I felt so much more confident when I was taller! Plus the table now seemed to be the same height as my sewing table at home that I was used to. So I convinced everyone in the room to let me stand on that board in all my standing scenes. You probably already noticed what I'm sewing... Colorful Patchwork Bags and Baskets! And they are fast and fun using gridded interfacing which I totally explain and demonstrate. The wonderful thing about using gridded interfacing and patchwork squares is that these projects are completely scalable. You can choose to make little baskets with little squares or huge baskets (like the one in the top photo above) with huge 10'' squares. The next project is these beautiful patchwork tote bags. Again, the finished size depends on which size fabric square you pick. 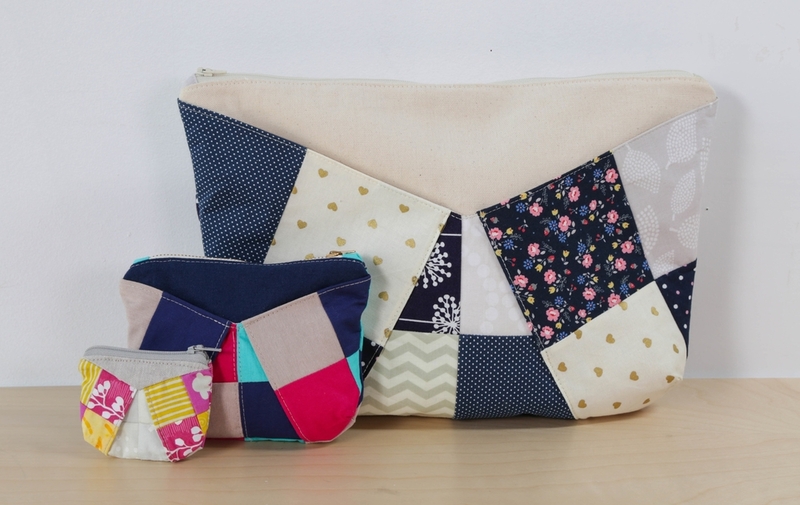 and then patchwork zipper pouches. In the last lesson I show you how to use the same design as the tote bags and make a patchwork zipper pouch instead - large or small. I'm so excited about this class. I worked so hard writing the script, sewing up baskets, tote bags, and zipper pouches in a gazillion different sizes, and making step-outs for on camera too. I was nervous when we first started filming, but soon I kind of forgot that the cameras were there and imagined different friends that I might be teaching the patterns to. Sometimes I imagined that I was teaching my 11 year old daughter Chloe... I really missed her! ***Update*** My class is now available! Click here to get Colorful Patchwork Bags and Baskets on sale!